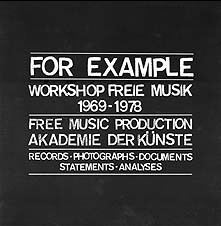 This special commemorative box was issued in 1978 by FMP to celebrate ten years of Workshop Freie Musik in Berlin. It consists of 3 LPs (numbered FMP R1; FMP R2; FMP R3 though on the individual covers they are numbered 'NR1' etc) and a 138 page LP-size book, all in a slip case. The book contains the programmes of each Workshop; many photographs; and essays, notes and writings in German and English by: Jost Gebers; Nele Hertling; R-May Teichmann; Peter Brötzmann; Steve Lacy; Wolfgang Burde; Ekkehard Jost; Wilhelm Liefland; Tomas Schmit; G. Fritze Margull; Nino Malfatti; Misha Mengelberg.